As with nearly all design sketches, the gargantuan wheels look straight out of Pimp My Ride. Skoda must be thinking a day without a teaser is a day wasted as the once humble brand of the Volkswagen Group keeps coming out with previews for its Kodiaq RS. 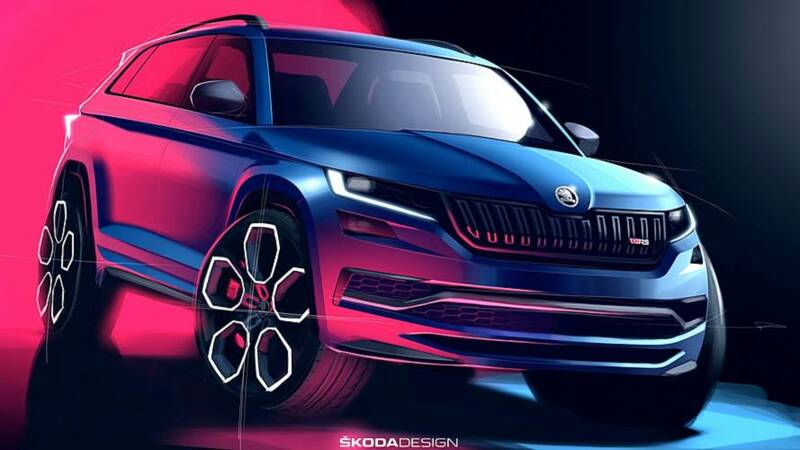 The automaker from Mladá Boleslav has published a couple of design sketches accentuating the sporty body of what will go down in history as Skoda’s first RS-badged SUV. Speaking of firsts, the speedy Kodiaq is the company’s first production model with an artificial engine sound enhancer and also the first to ride on 20-inch wheel as standard equipment, although the ones depicted in the adjacent teasers look way bigger. Don’t go thinking Skoda has invented a new way to open the doors without the need of conventional handles as the real thing will have them, along with significantly larger side mirrors and much thicker pillars. It will also feature a rear wiper, for better or worse. Despite coming out with numerous teasers like there’s no tomorrow, Skoda is still being rather coy on details. We only know the Kodiaq RS has a twin-turbodiesel engine channeling 236 horsepower (176 kilowatts) to both axles. We can probably safely assume torque stands at 396 pound-feet (500 Newton-meters), but it’s better to wait for an official confirmation. The fastest seven-seat production SUV at the Nürburgring will have full-LED headlights and the swanky digital instrument cluster as standard equipment. Those gargantuan red calipers hug 17-inch brake discs to provide the Kodiaq RS with the optimal stopping power. Also noticeable is the new red “RS” logo mounted on the front grille and on the tailgate, as well as onto the seats and quite possibly in other areas such as the steering wheel. We’ll get to see the production-ready Skoda Kodiaq RS at the Paris Motor Show from early October, although we won’t be too surprised if the reveal will take place online a few days sooner. Mladá Boleslav, 20 September 2018 – ŠKODA is offering a first overall impression of the new ŠKODA KODIAQ RS high-performance SUV by releasing two design sketches. Several accents in gloss black accentuate the dynamic appearance of the new, top-of-the-range SUV. It is the first of the brand’s SUVs to bear the RS initials, which adorn ŠKODA’s sportiest models. The emotive design comes alive thanks to the interplay of elegant lines, sporty contours and the typical robust nature of an SUV. The 176 kW (240 PS) ŠKODA KODIAQ RS will make its debut at the 2018 Paris Motor Show in October. The wide, 3D-effect radiator grille gives the ŠKODA KODIAQ an impressive presence. With a gloss black finish, it brings out the sporty character of the SUV – which is the only model to come with the most powerful production diesel engine in the history of the Czech brand. The roof rails, window frames and wing mirrors also shimmer in a sporty black. 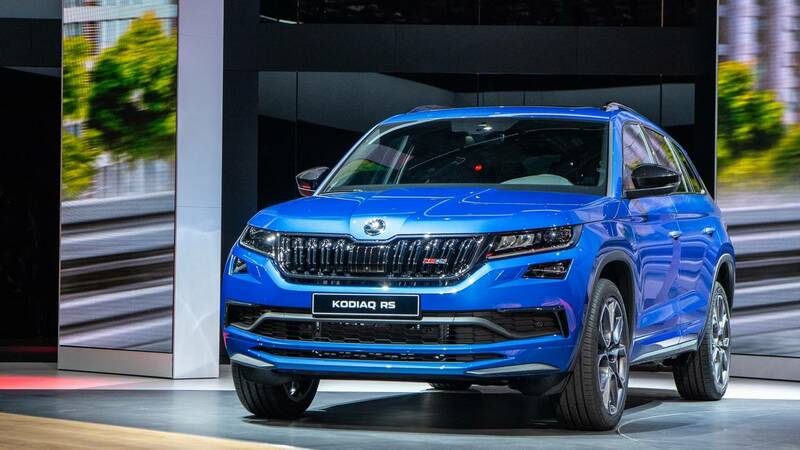 The KODIAQ RS is ŠKODA’s first SUV to be available in a metallic Race Blue finish. Furthermore, the SUV is the first member of the RS family to bear the new, modern RS logo including a now-red ‘v’ for victory on its radiator grille and rear. ŠKODA has developed new bumpers exclusively for the KODIAQ RS. At the front, the car’s self-assured appearance is emphasised by the crystalline-look, full-LED headlights – which also come as standard. A reflector extending across the entire width of the vehicle is integrated into the rear bumper – a distinguishing feature of all ŠKODA RS models. The exhaust system’s two striking tailpipes are clearly visible below the rear bumper. The KODIAQ RS is the first ŠKODA to include 20-inch alloy wheels in its standard equipment. The anthracite-coloured Xtreme wheels really highlight the SUV’s dynamic driving potential. The braking system, including 17-inch red brake callipers, is also designed for extraordinary driving performance. 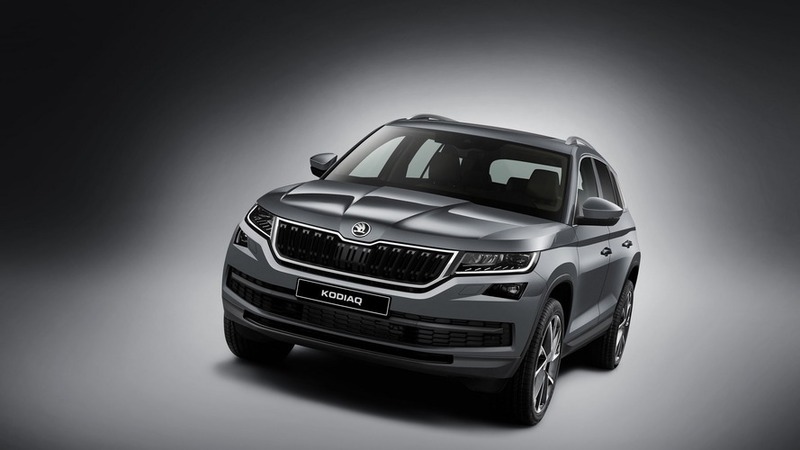 With the KODIAQ RS, ŠKODA is transferring the design language of its sporty models into the SUV segment for the first time, thereby creating a unique product identity. The dynamic, top-of-the-range model from the KODIAQ range will be introduced to the public at the 2018 Paris Motor Show in October.